Japan is famous for its newest technology products recently succeeded in developing a new technology in the process of scanning a book with a speed of 170-200 pages in one minute. This development was carried out by scientists from Tokyo University, which took over 2 years in the development of the prototype. 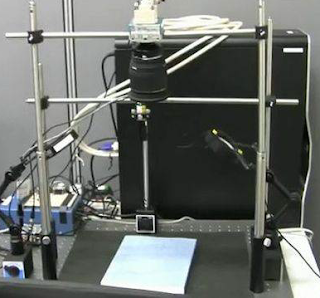 The scientists claim the scanner that they developed is the fastest book scanner in the world today that uses the technology of a camera that can shoot up to 500 images per second. The mechanism of image scanning system which is owned by the fastest scanner is to set the angle of deviation caused by the curvature that occurs when each page of the book quickly reversed. 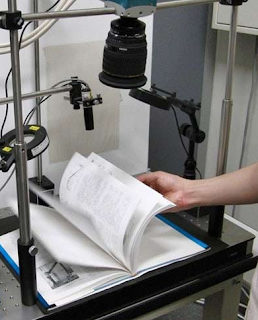 The settings are performed using three-dimensional infrared measurements so that each page of the book are drawn looks flat as the original page. In the future will consider the use of robots in reversing page per page automatically, so the results are more constant, fast, and neat. With this scanner is expected in the future will be more produced ebook of printed books that exist, so the reader can read the ebook using ipad Apple or Amazon Kindle. so you do not have to carry heavy-weight if you go anywhere, you just simply bring an ipad Apple or an Amazon Kindle is lighter weight. 3D technology that brought this scanner can be applied widely, both in the robotics industry or automotive industry. One Japanese scientist who was involved in research scanner says that the application of 3D technologies on the automotive industry will create a steering system that is more secure and comfortable. If the 3D technology was carried into a vehicle, it will be able to take 3D images of what lies ahead, whether it's an uneven road or other obstacles. While in industrial robotics, the application of 3D technologies in robot vision will make the robot move faster than humans. wow..that is interesting...must be expensive.. Cheers and thanks again for the comment! It's possible can be real, maybe next year some one will develop the technology... Everything can be real..
Great blog! I do so much scanning that this new technology will be helpful. It will solve the solution to my time limits and I'd buy it in a heart beat. Thanks for this info and update as I don't have TV and never see the news. Now I have your site to stay up to date. Thank You Jackie... I will always try to post the latest news..